Bob Schutte at V-Yachting tells me that his colleague Frank de Visscher is once again central agent for the sale of the 31m sailing yacht Raja Laut, and that her price has been reduced by $300,000. 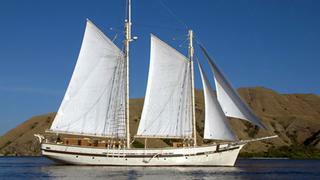 This classic gaff rigged schooner was designed by George Carraz in the tradition of the 19th century Baltic traders. She was purpose built for chartering in South East Asia, and her name means "king of the seas" in Malay. Behind the classic lines is a modern luxury sailing yacht, easily handled by a crew of 4, equipped with a 300hp engine, watermaker, and the latest in navigation & satellite technology. Her rich timber interior is complemented by wide open decks and a full range of modern technology including air conditioned cabins, multimedia and satellite internet facilities. She can accommodate up to 12 guests in six cabins. Raja Laut is now asking $1.3 million, down from $1.6 million.